Want to hear the creepy story of Robert, Key West‘s resident haunted doll? Or see Ernest Hemingway’s ghostly specter? Maybe a haunted elevator is more to your liking? After spending a hot day at the beach, cool off with chills down your spine at the Key West Ghost Tour. 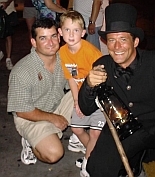 Resident ghost tour guides will walk you through the streets of Key West telling tales that will scare and delight you. Fun for the entire family, the tour guides are paranormal enthusiasts whose brilliant story telling create an otherworldly backdrop to set their tales upon. Purchase Discount Tickets for Key West Ghost Tours. Tickets are sold and the tour begins at the 8 pm and 9 pm at the corner of Duval and Fleming Street. The tour is popular among tourists and locals alike. Having been featured everywhere from the BBC to the Travel Channel, getting tickets ahead of time is a must. You can purchase tickets at their storefront or to ensure your presence at the tour, purchase your tickets online and laze on the beach until it’s time for your haunted tour.